1. Start with cutting out two squares same size (mine were 20×20 cm) out of the fabric. 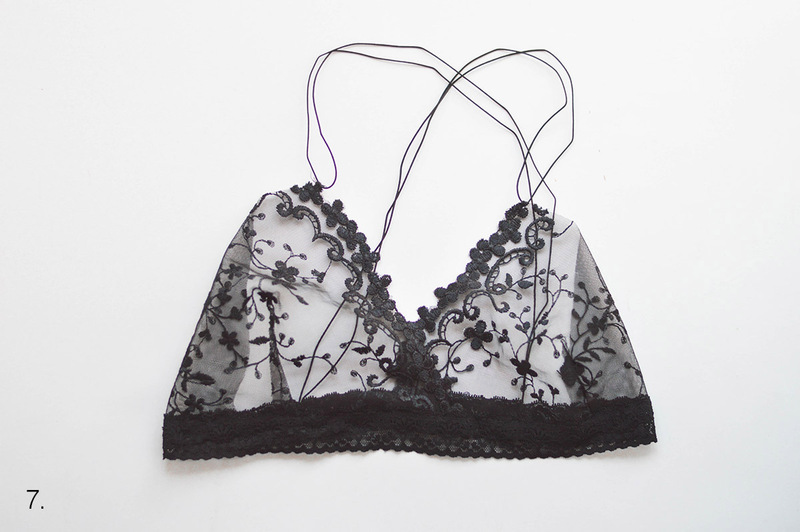 One of the four sides should be with lace now, this one is the side in the middle of your bralette. With a bra or your breast measure how much fabric in the middle you won’t need of this square. Pin it with pins (like on picture 1). 2. Sew along this line (I did it by hand, I think it’s the easiest way here) and cut the fabric inside away. It should look something like the thing on picture 2. 3. Do step 2 again, just mirror-inverted. If you lay the two pieces next to each other it should look like picture 3. 4. Now take your elastic ribbon and sew it together. Try it on, now is the chance to change anything if it’s not fitting! 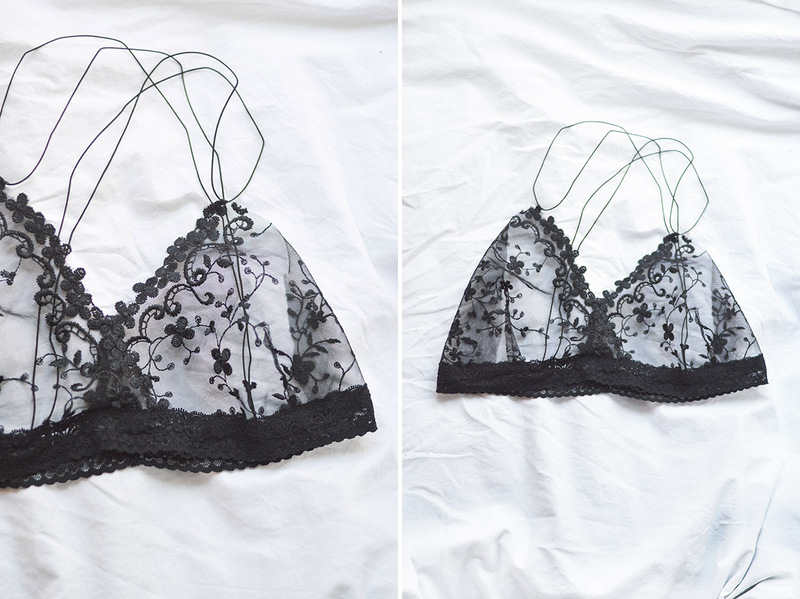 Then pin the two bra-cups on the ribbon. As you can see, my cups were a little bit overlapping. Try it again and change, if necessary. Then sew the cups on the ribbon (I also did this by hand). 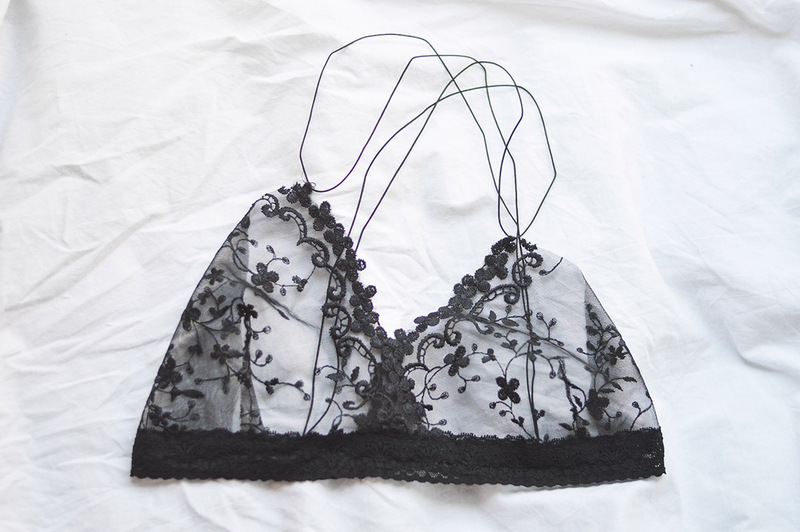 Cut away the fabric you don’t need. Mark the part of your straps and ribbon clearly. 6. Now sew the straps on.